For any organization that wishes to control its cloud infrastructure without getting locked into a vendor-specific cloud universe, OpenStack offers an ideal foundation for building a flexible cloud ecosystem. At its heart, OpenStack provides a set of open cloud computing services that can run on standard commodity hardware. In building out that cloud infrastructure, however, it is critical to work both visibility and application delivery into the design. Traditional methods for handling application delivery, such as load balancers (LBs) and application delivery controllers (ADCs), were designed for on-premise data centers and fell into the domain of the network administrators. Cloud computing represents a fundamental shift in both operational and administrative models. Cloud computing has moved the compute component from a dedicated application–to–fixed infrastructure model to one that is based on a detached set of pooled resources shared across multiple applications requiring minimal hands-on intervention from networking experts. Consequently, traditional methods for monitoring, troubleshooting, and optimizing application delivery are not effective in this new cloud paradigm. 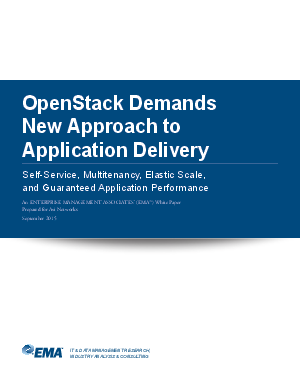 This white paper examines the challenges of guaranteeing application performance in OpenStack-based cloud environments and looks at new alternatives to traditional application delivery solutions.